Mix the soy sauce, honey, ketchup and garlic powder in a bowl, then pour thw mixture over the chicken legs. Put the chicken legs in the oven and bake for 20 minutes. 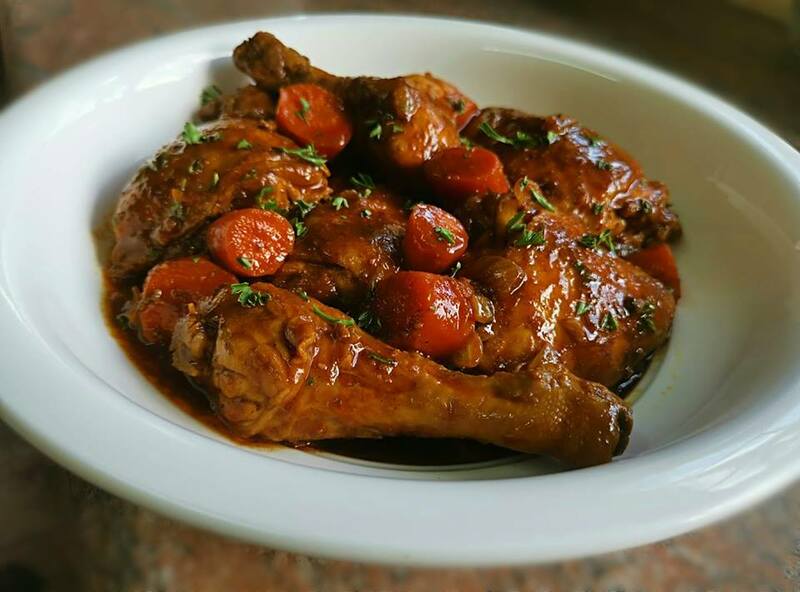 Take the chicken legs out of the oven and carefully flip the chicken legs with the tongs, so the part that was baked in the sauce is now on top. Return the chicken legs to the oven and bake for 20 minutes more. Turn on the oven broil and cook 4 minutes. 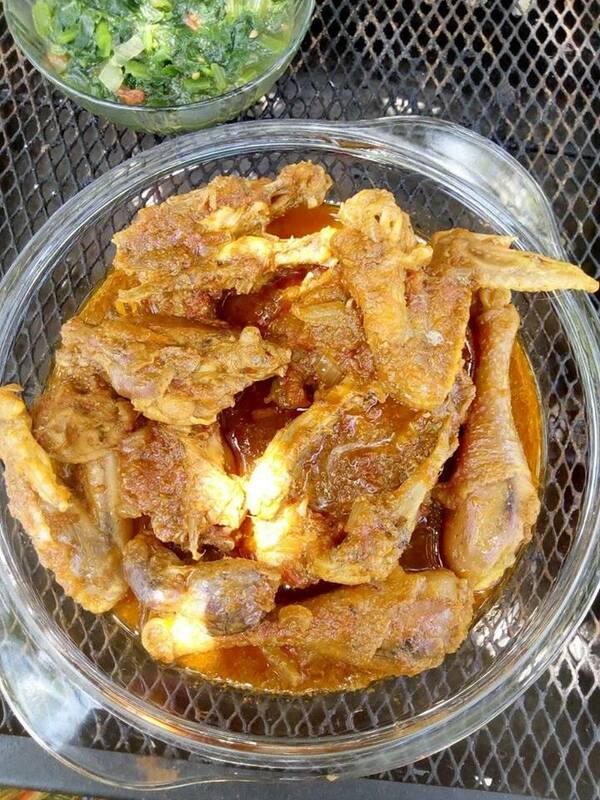 To serve, put the chicken legs on a platter and pour the honey soy sauce from the baking dish over the chicken legs. Try this recipe and your family will love it. 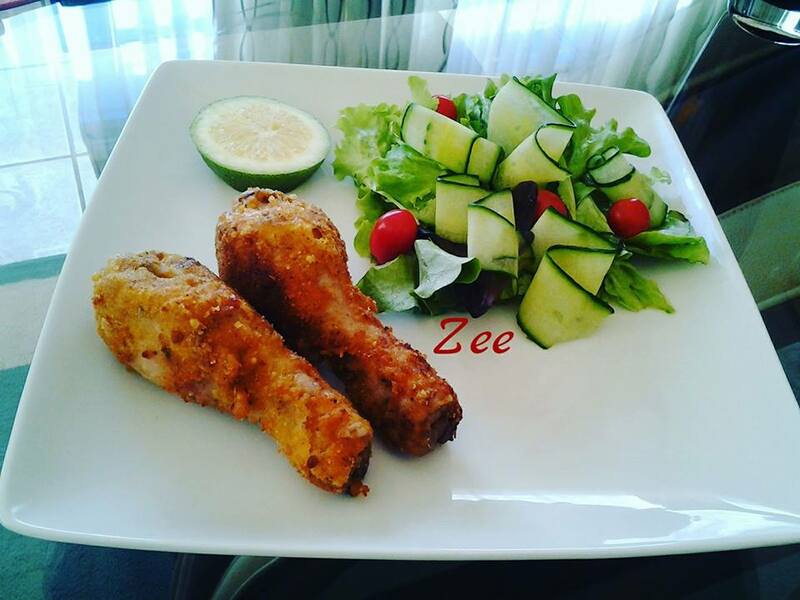 Cut the chicken into bite size pieces and transfer to a saucepan. Add enough cold water to cover the chicken and bring it to the boil. As soon as the water starts to boil, turn off the heat and drain off the water. heat the oil in a large non-stick pan, add the onions and cook until brown. Stir in the ginger and garlic and then the tomato. 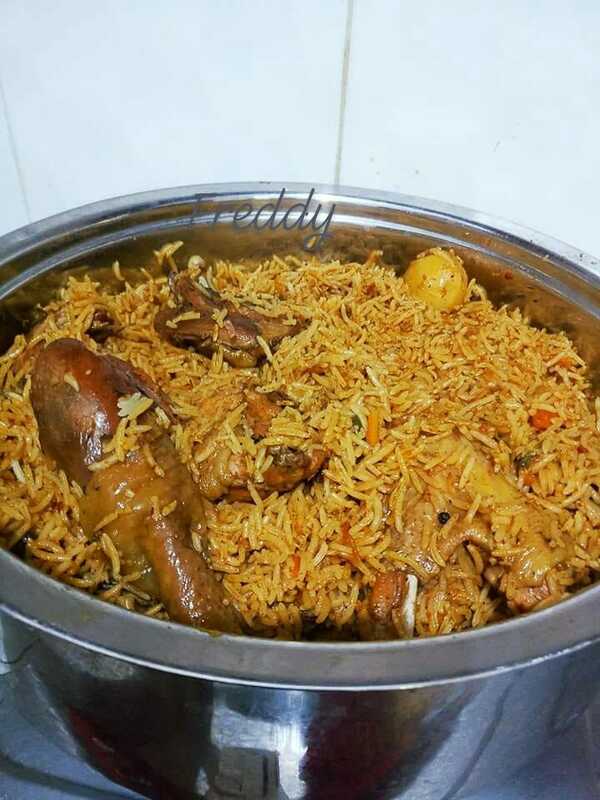 Cook for a minute and then add the remaining ingredients except for the rice, followed by the chicken. Add 50ml of the water and cook on a high heat for 5 minutes. The reduce the heat and simmer for 10 minutes. Add the rice and the remaining water. Cover and cook on a high heat until it starts to boil, then reduce the heat to low and cook until all the water has evaporated. Remove from the heat and allow to stand for 5-10 minutes before serving. 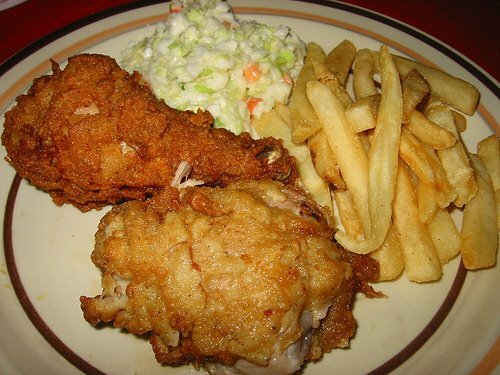 Chicken + coleslaw + fries. Cut ur chicken pieces and pat dry,add salt and course black pepper..get a plate put 1 cup flour then add crushed onion dry,garlic,salt,dry parsley,chilli or cayenne pepper,paprika….get a cup whole milk,dip the chicken pieces in whole milk and then get a zip lock bag put a bit of the flour mixture,after dipping in milk put in the zip lock bag shake fr 5 mins…then dip them in the remaining flour and then eggs and deep fry….soak ur potatoes in vinegar n water deep fry n coleslaw. Boil it until it’s tender,then fry it in the same pot,when its a bit brown,add tomatoes and onions,then let it cook..Add a bit of water let it simmer a bit and it’s ready. preheat oven to 340 degrees F – 170 degrees C -in a medium bowl or gallon size resealable plastic bag mix together the bread crumbs garlic powder salt pepper thyme and paprikacoat the chicken pieces with mayonnaise place chicken pieces in bowl/bag with bread crumb mixture and coat-shake until well coated place chicken pieces in a lightly greased 10 ×15 inch baking dish and bake for 40 minutes or until juices run clear. Heat oil in a deep-fryer or large saucepan to 375 degrees F (190 degrees C). Stir olive oil and lemon pepper together in a bowl. 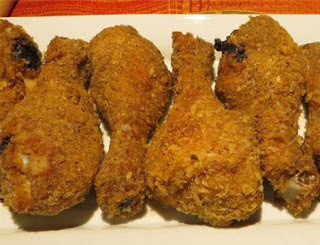 Fry the chicken wings in hot oil until no longer pink at the bone and the juices run clear, about 8 minutes. 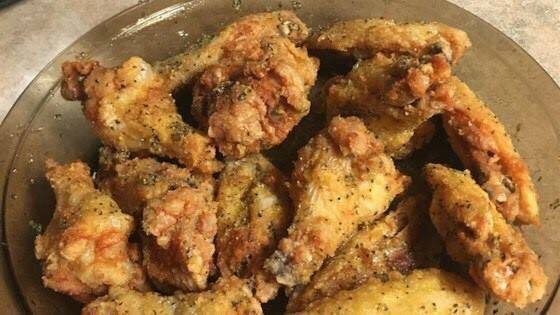 Toss hot wings with olive oil mixture to coat. You should have a cutting board made out of a hard plastic resin. Wooden cutting boards can and do develop cracks and you don’t want that, because it provides a place for bacteria to grow. That’s the last thing we want on our chicken. You will want a meat hammer made for tenderizing meat. Buy one as heavy as you can afford. You want one that is all metal and one piece if you can find it because it will be easy to clean up. You will want a roll of plastic wrap so you can cover your chicken with a layer of plastic before you beat it with your meat hammer. This way you will keep down the splatter and mess and make clean up so much easier. You’ll need one gallon plastic ziplock bag in which to marinate the chicken overnight. You’ll also need enough vegetable oil to fill your cooking pot 2-3 inches deep. You can thaw the chicken in its original package. Just be sure if any blood spills in your refrigerator to clean it up at once with a bleach and water solution. Open the package in your sink and drain away any juices or blood. Wash your chicken under cold running water then pat to dry. 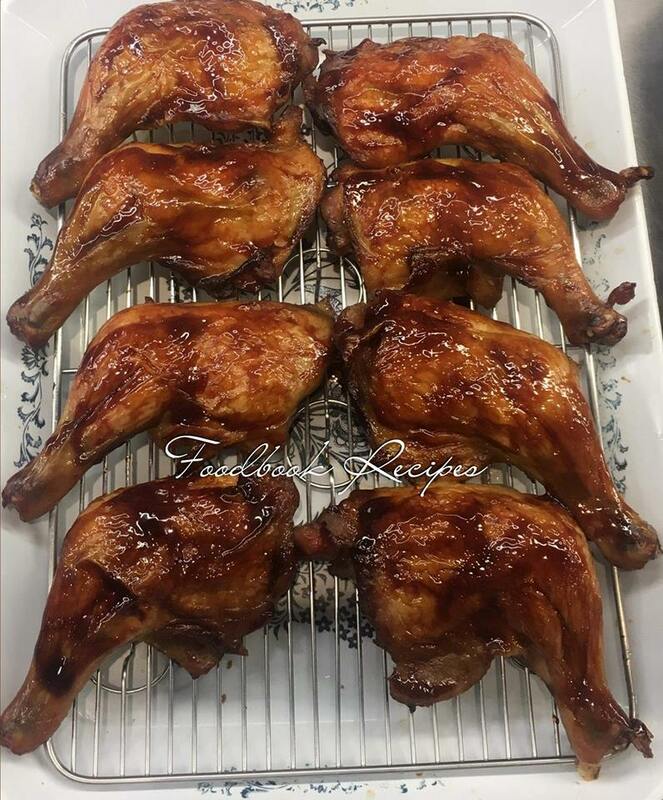 Move the chicken to your cutting board and cut each breast half into about 3 – 4 pieces, then lay it out on your cutting board and cover with plastic wrap. Beat the pieces flat with the meat hammer. Now place all your chicken into a ziplock bag and pour in the buttermilk and hot sauce. Close the bag and place it into your refrigerator overnight. The next day, whip the milk and eggs in a small bowl. In a large bowl add all the dry ingredients together very well. 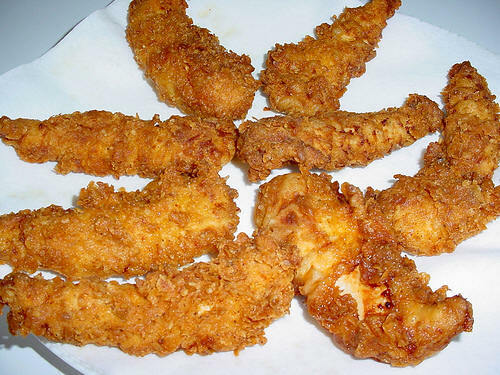 Take your chicken tenders out of their buttermilk solution and place them into the milk / egg mixture, then coat them very well with the dry mixture. Now it goes back into the milk / egg mixture and then back into the dry mixture. You will now have breaded your chicken tenders twice. When you take them out of the breading the second time, lay them side by side on a dish or baking pan. You will now want to use 2-3 inches of vegetable oil in a cooking pot. If you prefer to use a deep fryer, set it to 350°F. Now fry the chicken to a deep golden brown and drain on paper towels. You can now serve them with honey mustard or ranch dressing. Serve with carrot and celery sticks for a little temperature and texture variation.